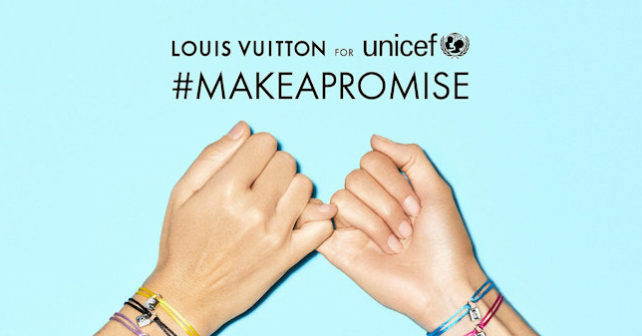 In partnership with UNICEF, Louis Vuitton has launched a new version of its Silver Lockit color bracelets to raise awareness and funds for Syrian children facing the world’s most challenging humanitarian crisis. The Silver Lockit renews Louis Vuitton’s commitment to support UNICEF and help raise funds for children in need. Since 2016, when Louis Vuitton launched the Silver Lockit, proceeds have been donated to UNICEF for each piece sold. The Silver Lockit, was inspired by the unpickable tumbler lock created by Georges Vuitton in 1890 as a symbol of protection. The sterling silver tumbler lock color cord bracelets are available in yellow, purple, pink, and black. The Silver Lockit color bracelet is $250, of which $100 is donated to UNICEF for each piece sold and are available online and at Louis Vuitton stores worldwide.